North Face Big Fat Frog 24 Tent Review: Is It The Best 2 Person Tent? Is It The Best 2 Person Tent? North Face has long been hailed as the industry leader in outdoor sporting equipment. And for a good reason. They use the best materials available to create some of the greatest camping gear & equipment. So, it should be no surprise that the Big Fat Frog 24 camping tent is one of the best on the market. The North Face Big Fat Frog tent is a two-person, 3-season tent that utilizes an advanced design and top of the line materials to give you one of the best camping experiences possible. We here at Camping Tent Reviews pride ourselves on telling you like it is. If a product isn't worth your time (even if it's from a trusted and popular name like North Face), then we won't recommend it to you. The naysayers of this North Face 2 person tent are far and few between--and when they do have bad things to say it's only as an afterthought to all of the advantages to choosing this model over any other. When these drawbacks are taken together, the Big Fat Frog tent fails to be perfect for any niche. It's too tight for only car camping and not light enough solely for backpacking--but, it's vestibule is gigantic, it packs small, and, most importantly, it's durable and will withstand all that the elements throw at you. Vestibule Area: 14.5 sq ft. This shelter features a three-pole structure, which can be time-consuming on certain tents. But with the Big Fat Frog, the poles are color-coded, making assembly a breeze. The vestibule for this 2 person tent is 14.5 square feet. This is a great advantage for campers who don't want to take up valuable interior space with their gear. If you're an above average-sized camper sharing this tent with another larger adult, you may find the sleeping quarters to be rather cramped. 31 square feet isn't a castle. But the pole-system gives you a lot of room that another, same-sized tent does not. In the end, it's still pretty cozy inside with two adults. With many 2 person tents on the market weighing in at around four pounds, the 6-pound weight of this tent may be a bit of a turn-off (as it was with a variety of North Face Big Fat Frog 24 review comments). But with so much vestibule space and a high performance design with the best materials available, this may be a small price to pay. But if you're a backpacker seeking to cut down on pounds, you might want to investigate our page on the best backpacking tents, as this is not one of them..
People tend to shy away from brands like North Face if only because they assume the tents will cost them their entire life savings. This isn't the case with the North Face Big Fat Frog 24. At less than $300, this tent is an absolute steal. 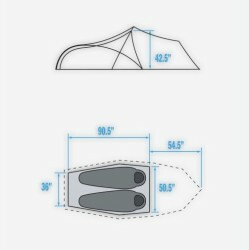 If you do pick up this tent (or at least give it a closer glance, as we at Camping Tent Reviews hope you do), be sure to buy the North Face Big Fat Frog 24 footprint. This will protect your shelter from the elements, lengthening its lifespan by years. Bottom line: This is a fantastic, hybrid tent at an inexpensive price. 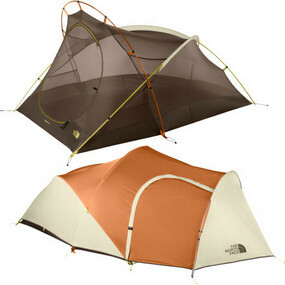 Have you used the North Face Big Fat Frog 24 Tent? Share your Big Fat Frog 24 Tent reviews and let us know how it worked for you!